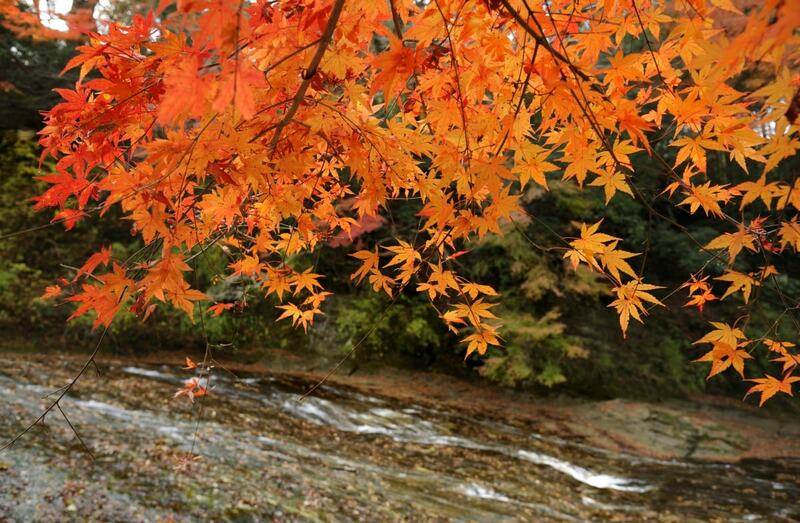 In Chiba Prefecture's Yoro Valley (or Yoro Keikoku), you can enjoy various natural landscapes in every season, including vibrant autumn colors. This place of mystery is easily accessible from the city center, making it a great spot to enjoy hiking or even barbecues out in nature. It wouldn't be an exaggeration to say the Yoro Valley is one of the best places to see the autumn colors. The prime viewing period is from the end of November until the first days of December. You can see the autumn colors at Awamata Falls or at Suigetsu Temple promenade, while at night you can see the leaves lit up with spectacular illumination. Check out the details below! The Kominato Railway has been open for 100 years, and even though it begins in the Chiba City metropolitan area, it quickly takes you straight into the local atmosphere. The starting point, Goi Station, can be accessed in an hour from Tokyo Station, or just 15 minutes from Chiba Station. The Kominato Railway features lovely, two-car trains in red and cream, offering a delightful platform for watching the big sky open up above and the various natural landscapes slipping by, called satoyama, the name given to undeveloped woodland near a populated area. Read a book, listen some music or look out the window while the train gently rocks you along. Yoro Keiko Station is roughly an hour from Goi Station. Be prepared to be welcomed by three cats when you disembark: they're the stationmasters, diligently watching over visitors as they arrive. The line will also soon welcome a new addition: the Satoyama Torokko Ressha, a restored steam locomotive that formerly ran on the Kominato Railway. It features four cars, open sides and a glass ceiling. Seats can be reserved by phone, and same-day tickets are available beginning 30 minutes prior to departure. Check here for more information! While you can get a bus from Yoro-Keikoku Station (just get on any one heading for Awamata), there are only about five a day on weekends, and it's just a 20-minute walk to Ryokan Kiyomoto. After a good little walk, it's time for a hot spring! Ryokan Kiyomoto still retains its old-fashioned feel, and its hot spring water comes up straight from deep underground startlingly black! This kuroyu (literally, black hot water) is said to be particularly effective for keeping your skin beautiful. Towel rentals for day visitors are ¥900. Grab one of those rare buses and get off at Awamata. Before checking out Awamata Falls, hike about a kilometer (0.62 miles) up the trail to Goriyaku Tei, part of the Goriyaku-no-Yu hot springs complex. Goriyaku Tei offers you a chance to prepare your own charcoal-grilled cuisine without the trouble of any preparation beyond a simple reservation (though reservation is always required). Here you can sit in a wide room with large window opened toward the river and enjoy a view that changes with the seasons. Grill up some delicious local produce, like high-quality Yoro beef and local lobsters, as you enjoy the countryside air! Awamata Falls tumble gently down over a 100-meter (328 -ft) cascading staircase. 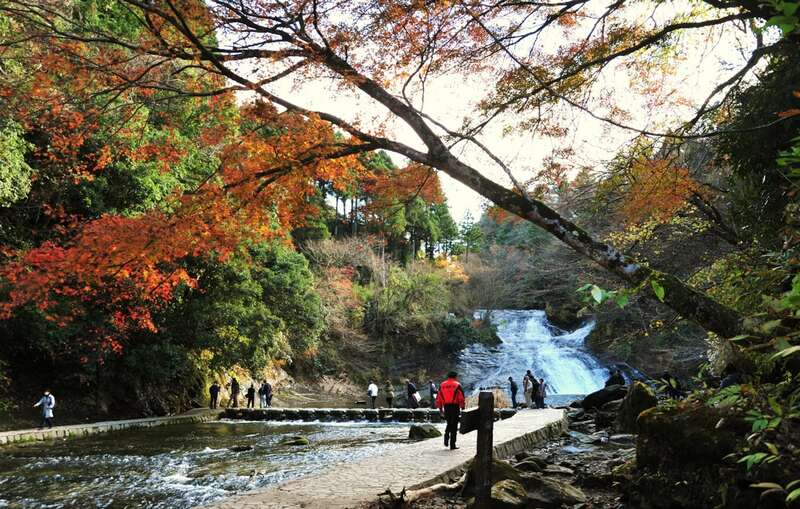 Amble along a 2-kilometer (1.2-mile) natural promenade to Suigetsuji Temple, enjoying seasonal flowers and the smaller Osawamata Falls on the way. Azaleas and wisterias bloom in the spring, while autumn is perfect for enjoying red leaves. The grounds of Suigetsuji Temple feature some 500 azaleas raised from seeds by the head priest of the temple, and nearby you can find Osawamata Falls, also known as Maboroshi ("Mirage") Falls. For a night's lodging we recommend Hito no Yado Takimien. This traditional Japanese-style inn offers seven rooms, each with an open-air hot spring bath. The rooms are placed along a deck terrace with a magical view. Located in close proximity to Awamata Falls, you can enjoy soaking in the hot water while savoring the sound of cascading water! You can either take the bus back up to Awamata, or just call Takimien and they'll send their own bus to pick you up wherever you are! Of course, food is a big part of enjoying a Japanese-style inn, or ryokan. At Takimien you can enjoy traditional multi-course kaiseki cuisine cooked with local seafood and seasonal mountain vegetables from Boso Peninsula.